A cherry sour from New Zealand for you today. If it was from Belgium it would be called a Kriek, a term many of you would be familiar with. I have quite high hopes for this beer, the last sour I had from Moa (a feijoa sour at GABS) was absolutely sensational. 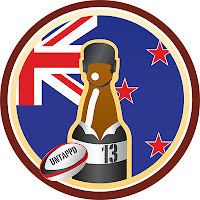 Today's badge is another that regular readers/Untappd users would be familiar with. Drink Like a Kiwi should be relatively self-explantory; it's for drinking beers from New Zealand. New Zealand may be a relatively small country by population (around: 4.5 million), but they produce a huge amount of excellent beers. Hopefully this Moa is one of them! Moa's Cherry Sour pours a bright red/pink colour. There is a tiny amount of very, very short lived white head, although it is gone within 10 seconds of pouring so hardly deserves a mention. The colour is quite phenomenal, it's almost opaque with almost no light escaping through it. Despite this, it's strangely not murky, it's like a constant think red colour - almost like a block colour. It really is very hard to describe, maybe you should buy one and pour one. Onto the nose and unsurprisingly a tart cherry aroma is the most prominent. It's a very fruity cherry smell, with very little overt sweetness. Woodiness is the other noticeable quality on the nose, it's certainly in the background, but is present. It's a really intriguing nose, and one I can't wait to try! Moa's Cherry Sour unfortunately didn't quite follow through on the promise of the nose. Yes, there is cherry and woodiness, and it's even quite sour. They are just in the wrong proportions, with the woodiness around the level I would like to see it, but the cherry just not stepping up to the plate. I just wish this had more cherry flavour! It's very close to being excellent! Despite how the above review reads; this beer is very close to being excellent. It is impressively tart with good, if not enough, cherry flavour. The beer has clearly spent a good time in barrels and this has imparted a lovely woodiness. If this beer had a stronger cherry flavour it would be truly excellent. Maybe the loss of cherry is in part due to the time the beer stayed cellaring? 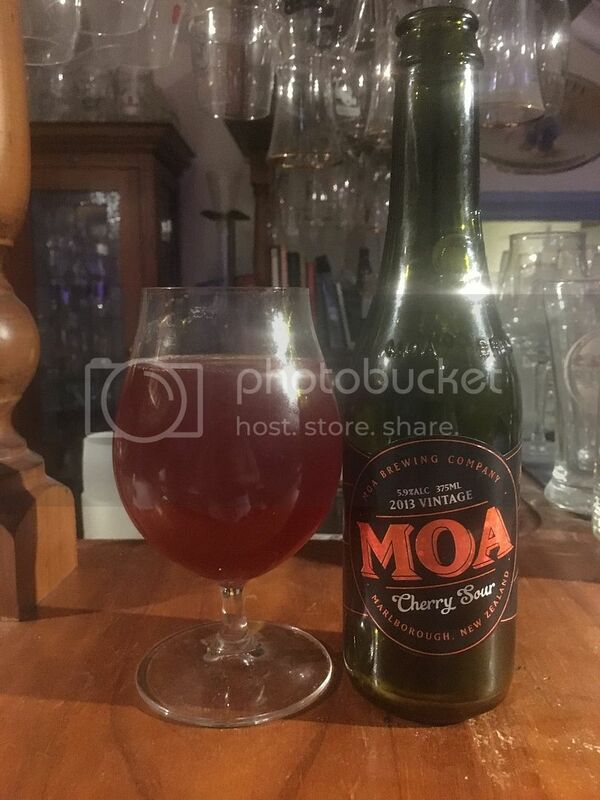 In any case, if you like sours I would buy any of the Moa ones that you come across, they are nice and sour and very impressive.